Download Spotlight and follow us for a chance to win a free shirt! The NBA season is a little over a quarter of the way done, so teams right at the point where they’ve found their identity moving forward. Most teams should have an idea of where they want to be realistically at the end of the season. We are still ways away from the trade deadline (February 8th), but that hasn’t stopped a few teams from already making a few tweaks to their roster. Philadelphia and Minnesota already pulled off potentially the blockbuster trade of the year by shipping Jimmy Butler to the 76ers for Dario Saric and Robert Covington. There’s a lot going on around the league already, with a lot of players seeming disgruntled with their current situation, which makes for the perfect recipe for potential trades. Let’s look at some of the biggest talks revolving around the teams and players. Is Fultz out of Philly? I’ve had some thoughts on what Charlotte should do with their roster, and I will be the first to admit, I was wrong (partially). The team is in the playoff hunt, and deservingly so. Kemba Walker, who was one of the most thrown-around names in the offseason among trade talks, has played like the best point guard in the Eastern Conference. However, that puts the Hornets in a tricky spot. Them being somewhat competitive makes going straight for a rebuild quite difficult. Now, they need to commit to being competitive, but they need to get Walker some help. The problem is they have some bad contracts and not a lot of assets. Nicolas Batum possibly has the worst contract in the league when he signed a five-year, $120 million contract a few years ago. He’s owed $24 million this year, $25.5 million next year, and a player option worth$27.1 million the following year (that he will likely opt into). Guys like Cody Zeller and Michael Kidd-Gilchrist also don’t have the most appealing contracts either. If they want to add a star player, who will likely carry a large contract, they will likely have to rid of one of these players, which won’t be very appealing to teams. Their best assets are Malik Monk, Miles Bridges, and maybe Jeremy Lamb. The Hornets can either try to attach one or two of those players along with a bad contract for a player like Bradley Beal, who I will touch on later. If they don’t make a move soon, it may be too late, and Walker can choose to bolt after this season. The Hornets need to decide now what they plan on doing, whether it being committing to being competitive, or deciding to tank, which would require trading away one of the best players in the Eastern Conference. What is going on in Washington? They have played poorly and well below expectations (though they have turned it around a bit as of late), management says that no player in untouchable, and players are rumored to want out of our nation’s capital. What should the Wizards do? Well, they should start by gauging the market for their players. Wall may be their best player, but he may have the smallest market out of their whole roster due to his enormous contract that kicks in next season. Beal probably has the biggest market, as his talents would fit with almost every team in the league. They have some solid role players and even young talent they could consider moving, but right now it’s a disaster in Washington. You can count on one hand the number of teams that would entertain trade talks with Wall. The Pelicans may consider a trade for Wall, which may appeal Anthony Davis in staying long-term(both are also former Kentucky Wildcats). The Spurs could use a star point guard, and their window to win is now. Detroit could form a nice big three in Andre Drummond and Blake Griffin, and can’t sign a big free agent until 2020 anyways, so trading for one makes more sense. Lastly the Heat struck out on a Butler trade, so making a move for Wall makes sense. Like Detroit, they won’t be able to sign any free agents for a while (they currently hold the highest payroll in the league), so if they want a star player, they will have to trade for one. If Washington had to move one between Wall and Beal, they would choose to move Wall, but he will obviously be harder to move. We saw last year Washington was able to succeed while Wall was hurt, so maybe it’s time to permanently make that change. The Cavs already made one trade this season when they traded away Kyle Korver for Alec Burks and two second round picks. There are still a few veterans they are trying to rid of while they are in the middle of their rebuild post-LeBron. J.R. Smith has already come out and said that he wants out of Cleveland and has even stepped away from basketball activities with the team. Smith still has the capability to light it up on any night, but his consistency has always been an issue. He would make for a solid punch off the bench on almost any team. George Hill is another name that could be on the move, who was putting together a nice season with Cleveland until he went down with an injury. He might not be the player he used to be, and probably not a viable starter on a contending team, but like Smith, he would be a great contributor off any bench. Cleveland wants to just tank this season and try to land one of the top prospects in this upcoming star-studded draft. The Lakers were off to a slow start but have put themselves in serious playoff conversation. Their eyes have always been set on this coming offseason, so don’t expect them to make a big move for a star to speed up their process. This year is all about getting LeBron James to play with the current roster, see who gels well with him, and then adjust at the end of the year. The Warriors have dropped in the standings since Steph Curry went out, and a feud between Kevin Durant and Draymond Green have people buzzing about their future. Could Green be on the move? I highly doubt that; he’s the glue that make this team work, and it appears the two have put their differences aside. But with only Curry guaranteed to stay after this season, look for some major changes next season. The Rockets have played well below expectations this season, and their problem looks to be on the defensive end. When you lose Ariza and Luc Mbah Moute and replace them with Carmelo Anthony, you are going to digress defensively. Look for them to make a trade for some wing help. The Pelicans need to get back to getting competitive soon, because they may be on the clock with Anthony Davis and his tenure there. There have been rumors surrounding Davis for the last few seasons, and it’s widely believed that if the Pelicans don’t remain competitive, he may decide to depart once his contract is up. They either need to make a move to get competitive, or gauge his market and see what kind of return they can get for one of the best players in the league. 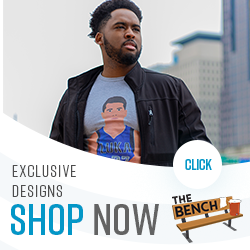 Use the code “BENCHSPORTS” for 25% off everything in our store!